One of the very few that use NEW oak barrel so you get all the wood and no whiskey influence – just pure tequila. Notes: This tequila is produced in the lowlands of the state of Jalisco, in the town of Tequila (yes, there is a town called that). This tequila is made in a state-of-the-art, but family-owned tequilera which dates to 1924 (while the family and a distillery can be traced back to the area for almost 300 years).The master distiller is the third generation descendant of the original owner. They also use the traditional Hornitos clay ovens unlike most of their rivals, who use live steam or huge steel ovens that look more like lumber drying kilns to quickly mass produce their idea of a tequila. The steel ovens and other shortcuts don’t yield the same results. This is the oldest expression of this particular line. The others being the youngest, Don Roberto Plata (Silver) , and Don Roberto Reposado (rested for 6 months in new white oak). Appearance: Crystal clear body, dark straw/gold baltic amber color from aging in oak casks. Almost could be mistaken for a young cognac because of the dark appearance. On swirling, it leaves a very light coating on the glass with very long legs forming. First Impression: Roasted peppers, tobacco, barrel char, vanilla oak, dark dried fruits, cleaner more aromatic smell than most Anejo tequilas. Taste: Somewhat delicate sap like start then followed by a dry pepper/woody tang and touches of leather, tobacco and oak. Finish is dry, light and bracing with a lovely briny spice to it. Drinks: Nicely dry and slightly smoky woody notes make it very good for a exotic martini. Does nicely with fever tree tonic and lime. A spicy, spritely and lovely Anejo with more presence in a drink than most so be careful how you use it. Cigars: Goes well with a Opus X or God of Fire – cameroon wrapper or possibly maduro. Bottle: Clear recycled glass with mild dimpling glass bottle with combination of silk screened graphics on clear plastic labels and parchment type paper labels make it easy to find in the crowded shelf. 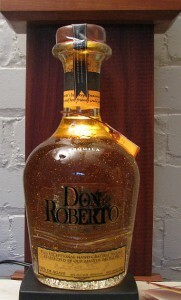 The color of the label is gold to match the color and age of the tequila. Cork closure with large wooden top give it a antique, rustic feel. Final Thoughts: A very interesting blend of flavors by the use of a lowland tequila barreled in a NEW oak barrel – most (O. K. almost all others) barrel their tequila in a used (usually bourbon ,sometimes rum or cognac) barrel. The use of fresh wood makes for a huge (and delightful) difference in the finished tequila. A very delicate and complex, possibly singular expression of tequila. Well Done! A fast loading site but not as detailed as some with information and pictures. Well done visually and lays out information well if a touch hard to get used to at first.